Situated in a rural location, this hotel is within 9 mi (15 km) of University of Siena, Porta Romana, and Piazza del Campo. Civic Museum and Palazzo Pubblico are also within 9 mi (15 km). Asciano Arbia Station is 19 minutes by foot. Situated in a rural location, this spa hotel is within 9 mi (15 km) of San Martino, University of Siena, and Piazza del Campo. Torre del Mangia and Civic Museum are also within 9 mi (15 km). Located in a rural location, this family-friendly residence is within 9 mi (15 km) of Porta Romana, University of Siena, and Siena Cathedral. Piazza del Campo and All'Orto de' Pecci are also within 9 mi (15 km). 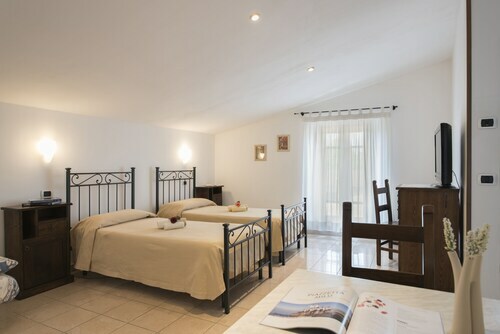 Situated in Asciano, this hotel is 0.4 mi (0.6 km) from Crete Senesi and within 6 mi (10 km) of Museo dell'Antica Grancia e dell'Olio and Pieve Romanica di San Vittore Church. San Giovanni Terme Rapolano and Terme Antica Querciolaia are also within 6 mi (10 km). Asciano Monte Oliveto Maggiore Station is only a 4-minute walk and Asciano Station is 29 minutes. How Much is a Hotel Room in Asciano? Hotels in Asciano start at $70 per night. Prices and availability subject to change. Additional terms may apply. Asciano has a wide range of first-rate lodging possibilities to select from. Right now, Travelocity's extensive and up-to-date database features 20 places to stay within a 6-mile (10-kilometer) radius of the city center of Asciano. Learn about many Travelocity-listed rooms within a 3 miles (5 kilometers) drive from Asciano's downtown area, including the Casa Vacanze e B&B Santa Caterina and Agriturismo Podere Fornaci. If you are after cheaper hotels try the Vesta, Montaperti Hotel Siena and Il Molinello. The Castello Banfi - Il Borgo is approximately 19 miles (31 kilometers) away from the center of Asciano. Another alternative is the Rosewood Castiglion del Bosco, which is situated 12 miles (20 kilometers) away. The Castel Monastero and also the Castello di Velona SPA Resort & Winery are two other places to book accommodation in Asciano. Once you have enjoyed Asciano, take a little time to uncover the many natural and cultural attractions of the Tuscany area. Tuscany proudly offers rural landscapes, beaches, coastal plains and rivers. Popular vacation draws are ruins and castles. Popular activities in this particular part of Italy include snowboarding, skiing and snow shoeing. Are you looking for things to do? Consider spending a day or two enjoying Archeological and Collegiate Church Museum and Torre Rognosa, in Val d'Elsa, 25 miles (39 kilometers) to the northwest of Asciano. If you'd like to stay in Val d'Elsa, check out the Tenuta Di Mensanello and Torraccia di Chiusi. Or, stay the night in Val d'Orcia, 17 miles (27 kilometers) to the south of Asciano, where you can pick from the Adler Thermae Spa & Wellness Resort and Hotel Osteria Dell Orcia. If you're staying in Val d'Orcia, make sure you venture to the Collegiate Church of San Quirico and Palazzo Chigi. Before your Asciano trip comes to an end, why not spend an hour or two enjoying the plays with some of Siena's spectators at a local game. Stadio Artemio Franchi is located 40 miles (63 kilometers) to the north of Asciano. Modern visitors who enjoy the ease of locating a room close by, book in the Four Seasons Hotel Firenze or The St. Regis Florence. Located 40 miles (67 kilometers) from Asciano's downtown area is Peretola Airport. 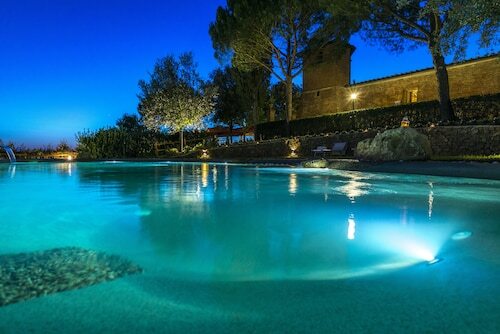 Stay nearby in Travelocity-listed accommodation at Torre di Bellosguardo or Sina Villa Medici.